Hello & welcome to another edition of our Warriors Weekly. Please be praying for our staff and students as we journey through God’s Word as our foundational lens to a Christian worldview. Easter is right around the corner! This Friday marks our last day before our Easter break. I think we all are getting a little antsy for a vacation. Our last day of school will be the 12th of April and we return back to school for Tuesday the 23rd. It's hard to believe we are only two months away from the last day of school! Mrs. Downs has been working with our Yearbook class all year to develop the very best collection of memories for your kiddos. Order forms will be available in the office beginning this week. Books can be purchased for $20! We finally made it! Our 2nd Annual Benefit Auction & Dinner is THIS SATURDAY. We want to thank our planning committees who have devoted some many hours, days, even months in preparing for this major fundraiser. We are excited to showcase all of the hard work throughout the year. We are also excited to showcase what the Lord is doing in the lives of many of your students. A few of your children were asked to consider sharing a brief testimonial during our event. We also have some great musical entertainment planned! Not to mention some fun games...perhaps even a Treasure Hunt. Tickets to our event can be found at CCCS, $35/single & $60/couple or on Eventbrite (please see below). Your ticket includes a delicious roast beef dinner by MTU catering as well as some special performances by our Warriors! Not to mention the opportunity to help support Christian Education in the Keweenaw. Time is running out-get your tickets this week! - We are looking for a variety of volunteers to help with the day of & before the event. If you are available, please contact myself or Mrs. Salo. Over the past few years, CCCS have been working on developing an all Sports Booster Club. The purpose of this Booster Club is to better support our athletic programs which our players & families love so much. To effectively grow our program, we are trying BOOST our program. In doing so, we better support our volunteer coaches, help cover travel expenses, reffing costs, hosting other teams, offer some flexibility when purchasing Warrior Gear, and various other things. GOOD NEWS CLUB BACK IN SESSION! Join us this Wednesday. --Good News Club is an exciting, fun-filled hour and a half, held each Wednesday. Click the link below to see what it's all about! What is Good News Club? Your children have been working hard towards our upcoming Spring Concert happening on May 17th! Make sure you have plans to join us at Glad Tidings Church of Hancock. Concert will begin @ 7pm with refreshments to follow. Check out what we've been learning in the classroom! Please be praying for our students, staff, as we welcome our friend from Bethany Baptist Church, Mr. Caleb Jackson, as he comes in to share God's Word with our staff & students. - GOOD NEWS CLUB 3:30-4:30pm! PIZZA PIZZA Friday Hot lunch! Sign-up for some delicious pizza. Sign-up sheets will be available Monday. CCCS 2nd Annual Benefit Dinner @ Auction. The ship takes sail @ 5pm! Don't ye miss the boat! 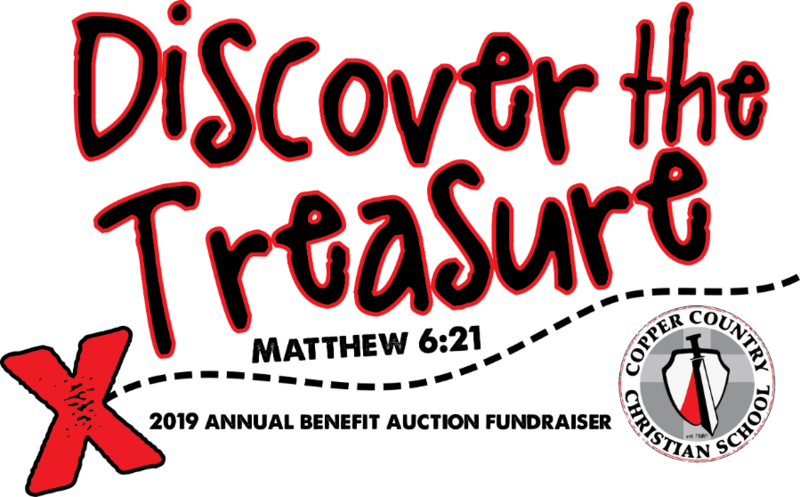 April 13th: Come Discover the Treasure as CCCS hosts our 2019 Benefit Dinner & Auction Fundraiser!